Editor's Note: Terri Lyne Carrington grew up in West Medford, Massachusetts, studied drumming with the legendary Alan Dawson, and went on to become a Grammy Award-winning jazz drummer, composer, record producer and entrepreneur. She has played with such luminaries as Dizzy Gillespie, Stan Getz, Clark Terry and Herbie Hancock and is now a professor at Berklee College of Music. On a Monday night in November, Terri Lyne brought her quartet to Johnson Theater at UNH, and Cary Kilner was there to tell us what he observed. Let’s say that you learn about an upcoming performance by a mainstream jazz artist. You plan to attend and hear some familiar music. After all, that’s what you like—standard jazz and show tunes, played by outstanding traditional and contemporary artists, making quality music to which you can relate. It’s swinging and lyrical, typically consisting of an interesting and imaginative treatment by a mature artist. The performance engenders something to which you can relate, with additional twists and turns provided by the artist that generate additional interest. You may not expect to do a lot of intellectual work yourself but rather to be entertained. However, we must let the artist go where she wishes to go, and to hell with our expectations—even if it's called the Traditional Jazz Series. Such was the case at this concert with Terri Lyne Carrington, given the definition of art as creativity and originality, and the definition of this art form as freedom within structure. I have enjoyed the mainstream artists who have come to UNH such as Dave McKenna, Benny Green, Russell Malone, Bill Charlap and Renee Rosnes, Marion McPartland, and, of course, Clark Terry. But these two concerts from this fall have opened my mind and ears further. Fred Hersch brought original music in the context of A Trio Is that I described in my previous review. He did play some standards but with a fresh treatment that surprised me—nevertheless they were thoroughly enjoyable performances. I recognized standard tunes by familiar stretches of melody that emerged from the complex arrangements. The music that Terri Lyne presented was similarly advanced but presented in quite a different format. 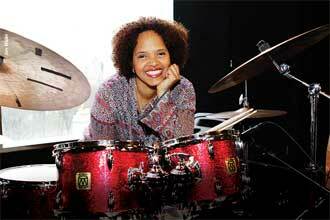 Her drumming reflects the modern percussion conception at Berklee from the 1970s and 1980s. Artists such as Alan Dawson, Fred Buda, Roy Haynes, Elvin Jones, and Tony Williams taught her extensive hand and foot independence, and demonstrated how the set could function more as a “pure” musical instrument rather than simply taking on a time-keeping role. She has played with mainstream artists like Herbie Hancock and Dianne Reeves as mentioned in the program, where she stayed right “in the pocket” while forwarding another’s conception as a sideman. Her father, Sonny Carrington, is a well-known traditional saxophonist. In fact, I played some jobs with him when I was studying and practicing in Boston, before coming to the Seacoast to teach high school chemistry. He certainly ensured that Terri knew her roots. However, I had not heard her recent CDs, The Mosaic Project or Monkey Jungle, from which she drew for this concert. Had I done so I might not have been as startled at the outset. But there’s nothing wrong with “surprises.” Isn’t that the nature of jazz? Although there were a few recognizable tunes within her performance, I only heard brief stretches of melody that I recall, such as Ellington's Come Sunday at one point. Otherwise, most of the performance consisted of her compositions that segued into each other in an ensemble format rather than with individual soloists being featured as I was expecting. Individual pieces did not have distinct sections, and the compositions evolved in a very organic and seamless manner with subtle changes in focus throughout. Periodically she would begin with a vamp and maintain it while other collective events swirled around her almost as embellishments to the vamp. Occasionally an actual “solo” would emerge, but more often as a part of the composition than as a separate musical statement. The pianist, Aaron Parks, contributed a subtle understated voice and provided lush and sweeping background colors. His fluid lines generated a rich harmonic tapestry upon which the others danced. He never overplayed in the ensemble; his orchestration was totally integrated into the compositions. There were also occasional sections in which he played unaccompanied that reminded me of Keith Jarrett’s solo work. Keith may have been an early influence but certainly was not being copied by this mature artist. One might wonder, did the format of the compositions that Terri Lyne presented in this concert reflect the interactive musical personalities of the members she chose to interpret her compositions, or did she specifically describe in rehearsal how she wanted each voice to participate? I think I would need to visit the aforementioned CDs to see how the group sounded in that studio setting for comparison. Zach Brown, the bass player, initially seemed to contribute a minor voice, since he did not function in the traditional time-keeping role. He wove in and out for a while in a rather understated manner and I was not quite sure what he was up to. However, he later astounded me with some highly technical yet totally musical sections, both in an integrated supporting role and as a melodic voice. His sound was warm and deep and yet he was not even playing his own instrument; he was playing a borrowed UNH student’s bass! I would like to hear him in A Trio Is setting where I suspect he might play in a manner similar to that of Miroslav Vitous. Antonio Hart alternated among soprano, alto, and flute, not stepping forward prominently as a soloist with rhythm section accompaniment but usually interwoven into the larger compositional whole. Often I saw him tentatively pick up an instrument as if he were going to play. He might then decide not to do so, or pick up a different horn, or play short rhythmic, harmonic, or melodic segments as supporting orchestration himself. His playing was very spiritual in nature as was the entire concert. You could hear his respect for the music Terri Lyne was presenting in how he contributed his own excellent performance in a very self-effacing way. Before the group began, they all bowed down from the stage in homage to the audience, which I thought was a very nice touch. It set the stage for a truly magnificent and modern performance.